What is wrong with this picture? 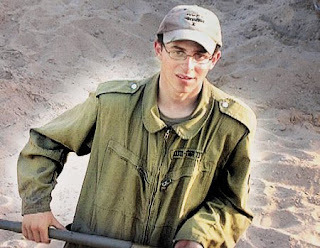 Israel is attempting to negotiate for the release of Gilad Shalit, a soldier who was captured by Hamas back in 2006. although he is believed to be alive, the Red Cross has not been allowed to meet with him. Hamas has refused to facilitate exchanges of letters and other courtesies extended to prisoners of war. Now, according to Haaretz, a leading Israeli daily paper, a videotape is due to be released tomorrow, October 2nd. Although about 2 months old, the video will prove that Shalit is alive. In exchange for this video, twenty female Arab prisoners who are incarcerated for security offenses will be released. Haaretz reports as follows. "For the first time since he was kidnapped by Hamas in a cross-border raid in June 2006, Israel will Friday receive a videotape of Gilad Shalit. The video will be delivered to Israel by a German mediator at about noon. At the same time, Israel will release 19 of the 20 female Palestinian prisoners it agreed to free in exchange for the tape. The 20th will be released only on Sunday, due to a foul-up by the Israel Prisons Service: It turns out that one of the women slated for release under the deal was in fact already released on Wednesday, after having a third deducted from her sentence for good behavior. Therefore, Israel must now find a substitute. " For twenty prisoners, you would think that the family of Shalit would get a phone call from their son. Also, how many Israelis have enjoyed the benefit of "time off for good behavior? Does anyone remember Samir Kuntar? Back in 1979, he burst into the apartment of an Israeli family. he killed a man in front of his 4 year old daughter. then he smashed the little girl's head against a rock repeatedly until she was dead. In 2008, this wretched approximation of a human being was released in a prisoner exchange. Israel got body parts, and Samir Kuntar got a hero's welcome in Lebanon, where a national holiday was declared in his honour. Well fed and looking robust, he greeeted a stadium packed with admirers, led by government leaders and Islamic clergy. Why the Israelis allowed this chromosomal human to live I will never figure out. he should have been released in the same condition as the soldiers received by Israel. May it be G-d's will that those who gathered to cheer and celebrate Samir Kuntar be judged with him as though they had acted with him. It is worth mentioning that Israel apologises and investigates when it kills an Arab civilian by accident. Israel's enemies by contrast laud and celebrate an individual who killed a jewish child with his bare hands. I am mentioning this simply to remind myself that this is not normal. A scale of justice is taken to weigh Israel's actions that is never employed to judge any other nation. I hope that Gilad Shalit is still alive. I hope and pray that he will be freed. But I can not forget that this young soldier is being treated with far less mercy than that shown to Samir Kuntar, the willful bare handed murderer of a four year old girl. What price will be paid for Gilad Shalit's release? I hope and pray that he will return home in peace and safety. Below is a video of a song of tribute to child killer Sami Kuntar, with video footage of his hero's welcome in Lebanon.